June Scobee Rogers, founding chairman of the Challenger Centers for Space Science Education, intends to become a teacher in space flying on one of the new suborbital spacecraft. Dr. Rogers revealed her plans at the 2012 Next Generation Suborbital Researchers Conference in Palo Alto, California. Update: Dr Alan Stern has revealed that Challenger has taken two of the six flights which the Suborbital Application Researchers Group purchased on Virgin Galactic’s SpaceShip Two. In addition to June Scobee Rogers, Challenger will pick one participant and one backup through a contest among the 48 Challenger Centers. NASA has a new video showing the commercial vehicles now being developed to take NASA crew to the International Space Station. These vehicles will also enable citizen space explorers to go to ISS and other destinations in Low Earth Orbit, including new space stations built by companies like Bigelow Aerospace. Thanks to RLV News for pointing this out. Rocket City Space Pioneers and its partner Spaceflight Services are offering a unique opportunity for small payload developers: a chance to share a ride to the Moon. Or at least, to lunar orbit. The NASA Flight Opportunities program and Game Changing Development Program are soliciting proposals for the development of onboard research facilities and other enhancements to suborbital spacecraft. The goal of the joint solicitation is to to increase the number of research and technology payloads that can be carried by commercial suborbital spacecraft. NASA desires proposals for enhancements and research facilities that support more than one user or can be carried by more than one spacecraft. If cost-effective, the proposed systems may make use of Shuttle- or ISS-heritage systems or other spacecraft standards (such as CubeSat). The NASA Flight Opportunities program and Game Changing Development Program are soliciting proposals to develop specific technologies for future NASA space missions by flight-testing on commercial suborbital spacecraft. Entrepreneurs, scientists, technologists, instrument builders, research managers, vehicle developers, and vehicle operators are encouraged to propose. The solicitation focuses on a limited number of technology areas selected from those defined in NASA’s draft Space Technology Roadmaps. On February 18, 1930, Pluto was discovered by amateur astronomer Clyde Tombaugh. Tombaugh was a citizen scientist – an amateur astronomer and telescope maker – who was hired by Lowell Observatory to search for a predicted but undiscovered planet beyond the orbit of Pluto. Although Pluto’s planet status was controversially revoked by the International Astronomical Union in 2006, the discovery of Pluto remains a powerful and convincing argument for the value of citizen science in training researchers. One way to honor Pluto’s birthday is to watch “The Pluto Files,” a PBS documentary with Neil deGrasse Tyson. You can buy the DVD or watch for free online at www.pbs.org. Better yet, you can joint IceHunters and help search for Kuiper-belt objects like Pluto in images taken by the 8-meter Subaru telescope on Mauna Kea, Hawaii and the 6.5-meter Magellan telescope in Chile. Red Bull is sponsoring a parachute jump from a high-altitude balloon at the edge of space – 120,000 feet. The project is called Stratos. In the early days of the Space Age, the US Air Force conducted high-altitude manned balloon experiments in Project Man High and Project Excelsior. In Project Excelsior, Colonel Joe Kittinger set a world’s record for the highest parachute jump, which the Stratos project seeks to break. The student-built satellite, called Charger-1, is an engineering project designed to test power and communication systems. The satellite is being built as an extracurricular project with no class credit – a shining example of citizen science. Paul Gattis of the Huntstville Times has more information here. Thanks to the development of microsatellites, universities and independents can now launch research craft for tens of thousands of dollars, rather than the multi-million dollar price tags of traditional launches. This new class of satellite is democratizing outer space exploration and offering NASA new opportunities to study little-known regions of the Earth’s atmosphere. These images, taken from the International Space Station, show the sort of views that citizen space explorers can expect. So says Nature, the international weekly journal of science. With endeavours ranging from air-pollution assessments in Europe to chimpanzee counting in Tanzania, the next generation of citizen science attempts to make communities active stakeholders in research that affects them, and use their work to push forward policy changes. NASA’s CubeSat Launch Initiative has selected 33 small satellites (nanosatellites) as candidates to fly as secondary payloads on NASA-sponsored launches in 2013 and 2014. 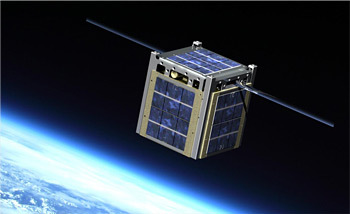 The CubeSat is an international standard for small payloads. The small size of CubeSat payloads makes the form factor ideally suited for citizen-science missions. Most of the 33 candidates came from established research organizations such as universities and other NASA centers. One, however, came from a citizen-science organization: the Radio Amateur Satellite Corporation, better known as Amsat. Draper Laboratories tested its GENIE guidance system (Guidance Embedded Navigator Integration Environment) on a recent flight of Masten Space System’s Xombie vehicle. Draper has now posted a Youtube video of the test flight.